Windsor Beacon readers voted and the results are in! 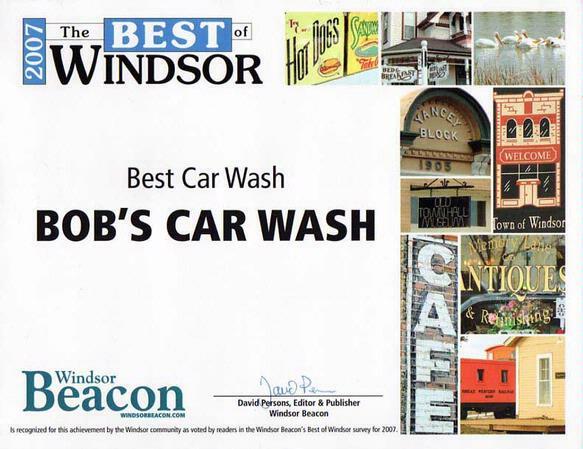 Bob's Car Wash was voted Best Car Wash in Windsor. CLEAN UP! by becoming a member today! As a member, you will enjoy additional savings and benefits such as Club discounts. It's easy to become a member. Simply create a new account using the link above and follow the easy instructions. We will send you a Wash Club card in the mail. benefit. Contact us today to request enrollment. continue to provide funds throughout the year. sewer where it is treated in state-approved facilities. Our car wash uses water efficient equipment to clean cars thoroughly while conserving water. always treated in state-approved facilities before it enters our creeks or rivers.